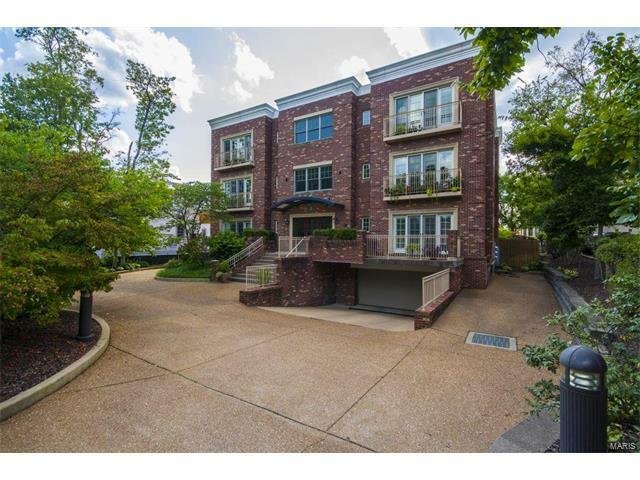 211 North Taylor is one of the most sought after Condos in Kirkwood! First Floor Unit with Full Balcony & Shared Courtyard. As you enter the foyer the Spacious Open Floor Plan welcomes you along with an abundance of Natural Light. Granite counter tops, Pantry with pull out shelves, gas stove with electric convection oven, Bosch Dishwasher & Refrigerator which are all Stainless Steel. Master Bedroom Suite has walk in closet. Master Bath boasts heated marble floors, jetted tub, shower & double sink vanity. Guest Bedroom is complete with Full Bath. Half Bath in hallway along with another Bedroom. Main Floor Laundry. Laminate Flooring in Living, Dining, Hallway & 1 Bedroom. Plantation Shutters on all Windows. Gas fireplace with Handsome Mantel, Marble base & 2 Electric outlets on top. Crown Molding, Elevator, Central Vac, All closets St Louis Closet Co, 2 Car Parking Spaces in Heated underground garage, Elevator, Storage Closet, Secure Building & More. HOA fees paid through 2017. Condo between the Kirkwood Library & YMCA. Park in partial driveway on the left side facing the condo or Park in Church parking lot right of condo. Condo is 102 on North side. As you enter the lobby turn left to 102.